I have already covered this grave marker and the information it contains in a very early post (here). 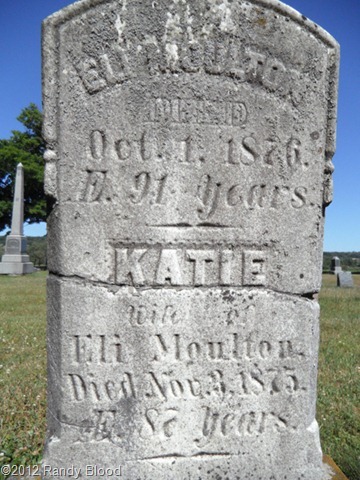 However, the grave marker photo I was using appears on the Find-A-Grave website and is subject to copyright, so I was not able to publish the photo on this blog. Please do not copy and share items you find online without first determining if the item falls under copyright. It does not have to have a copyright statement on it be covered by copyright. The best policy is to always contact the owner of the website or image and ask permission. In the case of the photo above, it is the property of Randy Blood. He owns the copyright and has given me permission to use it here on this blog. If any of my readers would like to use it, they need to contact Randy and ask his permission.